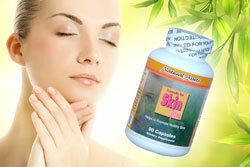 Best Natural Herbal Skin Care Vitamin Supplement Product. Improve, Increase & Bring Back Skin Elasticity. Build & Improve Skin Collagen. Top Vitamins for a Clear, Healthy & Aging Dry Skin. Replenish Aging Skin with Nature & Science! Skin Plus is one of the top vitamins for a healthy clear skin and an effective natural herbal skin care remedy for dry skin. It will also build & improve skin collagen structure. Formula for Skin Plus contains effective anti-aging / skin purifying herbs & best vitamins that promote healthy looking skin, smooth skin tone, and vibrant skin elasticity. Recommended Use: As a dietary supplement for adults. Take one to two capsules with meal, twice daily. Formulated with care by a pharmacist. The skin is the body's largest organ and depends on proper nutrition to stay healthy & beautiful. As people grows older, a deficit of key nutrients will often appear on your skin as wrinkles, sagging, skin age spots, and dry areas. People would need proper vitamins, minerals, natural nutrients, and essential fats to provide the basic foundation to keep the skin clear & healthy. Skin Plus is the answer and the top remedy for skin age spots (liver spots) and dry skin. Beautiful Skin Begins Far Below the Outer Layer! A healthy, vibrant, and elastic skin can be achieved with plenty of daily water intake, and a diet rich in fruits, vegetables, antioxidants, essential fatty acids, & vitamins. What Makes Formula for Skin Plus So Effective? Formula for Skin Plus is the only effective Triple Action Formula in the market! It offers the safe and unique formulation of ingredients that provide the essential building block for a beautiful & healthy looking soft skin. Protect skin from free radicals with top quality antioxidants, bioflavonoids and herbs. Reduce skin dryness with essential fatty acids and natural nutrients. What More Can Formula for Skin Plus Offer? Most of the best skin vitamin supplement on the market have some common herbs such as Citrus Bioflavonoid and Grape Seed, but the best just wasn't good enough! We always wanted an absolute best and has taken it to the Next Level. All of our vitamins and natural ingredients are top quality potent ingredients and certified by our laboratory for safety and potency. Furthermore, all the herbs in our products are going through a special extraction manufacturing process to deliver at least 4 to 20 times higher potency than ordinary herbs' normal strength. But there are more. Some of our ingredients are further processed to contain a standardized ACTIVE nutrient that makes that herb more powerful. An example is our Grape Seed Extracts that contains minimum 95% Proanthocyanidins, the active nutrient that provides Grape Seed its great effectiveness. Therefore, the formula has a proven history of working very quickly. Build the Foundation for a Soft & Healthy Looking Skin! Collagen act as a glue that binds our cells together. As we aged, collagen production declines due to lack of protein, inadequate daily water intake, and unbalance pH level that affects the absorption of protein and other nutrients. Supplementation of natural compounds may provide the solution to age-related collagen deficits. Collagen Type 1 & 3 is a fibrous protein constituent of skin, cartilage, bone and other connective tissues. Collagens are essential for tying cell to cell and make up 75% of our human skin. Oral supplementation of collagen type 1 & 3 may promote healthy skin tone & clear complexion, bring back & increase facial skin elasticity and improve skin collagen structure. It's one of the best sagging skin remedies. Fish Collagen Protein is adapted from Japanese researchers who found the product to improve & bring back skin elasticity and thickness. Various American and European dermatologists also have shown by clinical research that fish proteins may also adequately maintain and improve skin moisture content and is one the best natural dry skin remedies. The main function of fish proteins is to increase the thickness of the derma layer of the skin thereby providing protection from the damaging sun rays. Fish protein, a natural anti aging skin vitamin, can also serve as anti-oxidants to prevent skin aging from toxic free radicals produced by the human body. Fish proteins also have the ability to self-repair skin cells and reorganize human skin structure to increase elasticity in facial skin and improve skin tone. It's one of the best vitamins to build up & improve collagen formation & structure. Glucosamine is a component of carbohydrates that are incorporated into the structure of body tissues. Glucosamine is therefore involved in the formation of nails, tendons, ligaments, and skin. The substance glucosamine is widely used for osteoarthritis in part because it seems to help collagen regeneration. For this reason, glucosamine is considered one of the best vitamins for the healthy skin & has been advocated as a treatment of aging skin. Supplemental glucosamine can be helpful to improve & bring back healthy skin elasticity and adequate connective tissue strength. In a single-blinded trial, 72 women with symptoms of aging skin were divided into two unequal groups: a placebo group that received no treatment, compared to a treatment group that received a proprietary mixture of glucosamine and other antioxidants. The results showed greater improvement in skin aging in the treated group". Red Clover, one of the good herbs for skin, has a long history of traditional application as a "blood-purifying" herb that stimulates detoxification through the liver and gallbladder. A "clean" liver & gallbladder may help to generate a good and healthy skin. In the United Kingdom, Red Clover is approved for use in skin conditions such as psoriasis, eczema and various skin rashes. Flaxseed contains EFAs (essential fatty acids) that could be helpful in combating skin dryness. EFAs are the beneficial components of polyunsaturated fats and are critical in building healthy cells including skin cells. The active component of flaxseed is considered one of the best herbs for acne & an effective herbal acne skin care natural treatment. Skin pigmentation often degrades overtime. As we aged and exposed to UV rays, these flat, brown discolorations called age spots or liver spots generally appear on the neck, face, and hands. While harmless, these age liver spots are by-products of free radicals that indicate our skin cells are loaded with wastes known as lipofuscins. These wastes occur beneath the skin and can destroy cells through out the body. Grape Seed Extracts promote healthy skin care, improve & bring back skin elasticity, provide a smoother and more youthful looking skin texture & complexion. Citrus Bioflavonoid is a strong anti-oxidant substance that has been shown to aid in preventing sun skin damage. Grape Seed is a more powerful anti-oxidant than Vitamin C and Vitamin E in scavenging oxygen free radicals in the human body. It's a best natural anti aging skin care vitamin & remedy. Toxic free radicals are unstable molecules that damage cells and tissues throughout the body. Researchers are now linking free radicals to premature skin wrinkles and sagging skin. Grape seeds also reinforce the structure of collagen and prevent its destruction and is one the best sagging skin remedies. Collagen is the substance that makes up skin, tendons, cartilage, ligaments, and blood vessels. Grape seeds have been researched to reinforce collagen by binding and cross-linking collagen fibers. Grape seeds also enhance the ability of collagen to self-repair, therefore protecting human skin against degenerative processes and toxic skin attackers. The active ingredients polyphenols in grape seed extract are beneficial for promoting youthful looking skin because they support cellular health, elasticity, and flexibility (Shi 2003). Some evidence suggests that Grade Seed extracts work by protecting and strengthening collagen and elastin. These proteins are found in blood vessels as well as in cartilage, tendons, skin and muscles. The net effect may be due to strengthening of blood vessels, thereby reducing leakage of fluid and blood. In addition, these beneficial effects on collagen and elastin could theoretically help normalize aging skin. In another eight-week study, researchers determined that grape seed extract also exhibited a beneficial impact on pigment imbalances in facial skin (Yamakoshi 2003). Grape seed is a potent herbal anti aging skin care vitamin and top vitamin to improve & strengthen collagen structure. Order your Formula for Skin Plus Without Risk Today! Citrus Bioflavonoids is a potent anti-oxidant herbal skin care product that fights free radicals, strengthens the capillaries that feed the skin and one of the best natural skin care remedies. Flavonoids is a chemical compound that fruits and plants produced to protect themselves from parasites, bacteria and cell injury. In fact, flavonoids protect the anti-oxidant vitamins from oxidative damage. Flavonoids are also essential for the formation of collagen, a protein that provides the skin its flexibility thus protecting and strengthening collagen and elastin. In an ideal situation, a diet rich in fruits, vegetables, antioxidants, essential fatty acids, & vitamins should provide the necessary nutrients the skin needs. However, most people will not be able to consume enough foods that provide these high anti aging / antioxidant benefits. GOOD NEWS! Our AbsoGreens product has the answer. It's a best anti aging natural supplement that provide the necessary daily requirements of high ORAC value green vegetables, berry fruits, and herbs that have high antioxidants benefits. These powerful natural antioxidants has been shown to have the capability to deactivate free radicals' ability to harm skin cells. AbsoGreens is perfect complement for Formula for Skin Plus as they both promote a more youthful skin appearance, and a fountain of youth for your skin. Water is the most important nutrient for skin health. Your complexion depends on water. Water help promotes skin cells to a more vibrant & youthful appearance. It remove wastes to keep the skin free of age spots, black heads, and pimples. Studies have indicated that fatty acids from fish oils omega 3 antioxidant can improve skin disorders such as psoriasis that commonly features itching, scaling, and erythema (redness of the skin caused by solar ultraviolet light). Omega-3 fatty acids inhibits the production of inflammatory compounds that occurred greater than normal in the skin of the persons with psoriasis. Clinical trails have shown that omega-3 fatty acids can be successful in the treatment of eczema as epidermal cells can be very active in the conversion of essential fatty acids into prostaglandin hormones, which determine the smoothness and moisture of the skin. In conclusion, Formula for Skin Plus is the best herbal treatment and natural healing medicine for bringing back facial skin elasticity & smooth skin texture, reducing dry aging skin, and eliminating skin spots & acne. It offers top quality standardized extracts of selected herbs for natural healthy skin care to ensure that consumers receive consistent and potent benefits from the herbs active compounds while retaining all the tradition whole-part characteristics from other complementary herbs. This natural herbal skin moisturizer supplement is also an effective home remedy for skin spots and one of the best dry skin remedies. Phyllis A. Balch, CNC, James F. Balch, MD. "Prescription for Nutritional Healing. Avery - New York. 2000. Moser, U. omega-3 and omega-6 PUFAs in healthy and diseased skin. Roche Vitamins Europe Ltd, Switz. Journal of Applied Cosmetology (2002), 20(2), 137-142.